Happy New Year! 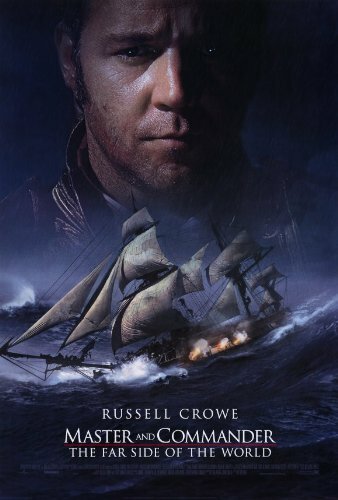 The first movie I watched in 2019, and the next film in the 2018/19 New Year’s Eve/Day Binge-a-Thon is Russell Crowe’s starring vessel, Master and Commander: The Far Side of the World. I will admit, there was a chunk of this movie that I was not sure exactly what was going on. I feel that is as much my fault, if not more, than that of the movie. This feels as if Master and Commander is a movie that demands 100% attention right from the start and I was a little bit sleepy yet when I started it. Nevertheless, I got more into the film as it progressed. I found it to be a strong film with a lot of great sea faring action. Russell Crowe was great as Captain Jack Aubrey but my favorite character was easily Doctor Stephen Maturin, played by the awesome Paul Bettany. The scene where he operates on himself is just stunning. I found the relationship between Captain Aubrey and Dr. Maturin to be strong and compelling. The relationship was the focus of the novels that this movie was based on, specifically two Napoleonic War-era adventure novels by author Patrick O’Brian. I am not sure there is a real through-line for the story as the film felt like it was more a series of scenes on the open seas strung together. The French ship they were chasing was really more of a white whale for most of the movie than a real enemy. However, I did enjoy the scenes of sea battle. I did have some trouble following it at times, but the spectacle is without doubt. I admired this movie. It was a good time, and it needs me to institute a new category. The “Good Stuff” category is around the “Fun Time” category, but leans toward a more serious tone and film.